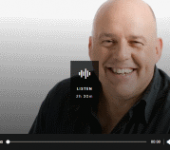 Professor John Quiggin from the University of Queensland and I discussed the NEG with Steve Austin on Brisbane ABC Radio last Friday. We agreed on a couple of things. One was that network charges are the biggest contributor to electricity prices, and the other was that the NEG wouldn’t mean lower prices. However, what we meant by “lower prices” were two different things. What he meant was that the current system would be cheaper for electricity than the NEG, and what I meant was that while an increase in intermittent renewables was part of an electricity system, prices would go up. With more intermittents, Quiggin expects prices to fall, and I expect them to rise. You can listen to the exchange by clicking here and going to 2:03:00. The professor made a number of claims that were just flat out wrong, surprising in an academic with some expertise in this area, having been at one time an electricity regulator. Claim 1: New coal costs more than the combination of renewables plus storage, which is why coal-fired power stations are being cancelled at a massive rate. This is wrong for a number of reasons. While some coal-fired power stations may have been cancelled, there is considerable growth in thermal energy around the world, including coal-fired power stations. If intermittent renewables were cheaper than coal, then countries like China and India, which are brown fields sites, in terms of industrial development, would be powering their economies on intermittents. In fact they aren’t. 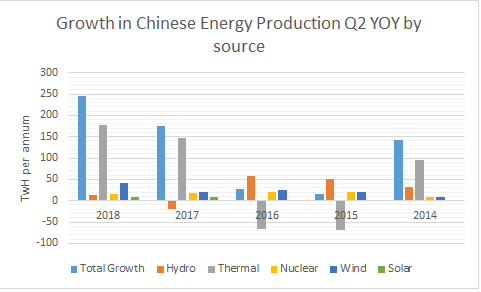 The graph below demonstrates that point in the case of China with the growth in thermal power being well in advance of the growth in anything else. There was a decline in 2015 and 2016, but that has been more than reversed, and presumably relates to the closure of older, more polluting plants. While my primary evidence is what is happening at the moment, because that is fact not speculation, there are plenty of news articles that point to substantial future investment in coal by China and others. Such as this one in the New York Times or this one from the World Construction Network. While it is beside the point in this context, it is relevant in the broader context that China is substantially increasing its fleet of nuclear reactors. Statista claims China has 41 planned nuclear projects as of April, 2018. The World Nuclear Association says China currently has 18 nuclear reactors under construction. Professor Quiggin also misrepresents the storage situation. AIP Fellow Geoff Carmody has written extensively about the prohibitive cost of storage as the penetration of renewables increases, most recently here. As I explain in the interview, intermittent renewables require significant back-up, and it increases as they displace baseload power. Solar is available only around 20% of the time on average, and wind 30%. So you need roughly 5 MW capacity of solar to equal 1 MW capacity of thermal, and the battery storage will be of an even larger order of magnitude. And that is just at averages. As we go for days without good sunlight and wind, that increases the backup required. Further support for this case comes from an MIT study, referenced in this Technology Review article. Professor Quiggin starts on this around 2:12:00. At best this is a linguistic sleight of hand, only possible if you distinguish between “the taxpayer” and “taxpayers”, and offer the narrow pleading that the government doesn’t directly pay providers of wind and solar out of the federal or state budget. This is technically correct, but the government facilitates a payment to generators of intermittent energy by mandating that power retailers need to buy large- and small-scale generation certificates from them so that they can sell power. This was Tony Abbott’s way of implementing a tax on CO2 emissions without calling it a tax, because he had already ruled-out an emissions tax. So the price of electricity for all consumers is raised. Call it what you will, the taxpayer is contributing significantly to intermittent energy, and propping it up, with a cost estimated at around $2.8 Billion. Electricity consumers pay this cost, and those of them who aren’t taxpayers are likely to be retirees, unemployed, or in some other way involuntarily out of the workforce. Professor Quiggin makes that claim a number of times, including around 2:15:00. He says the rate of return on the network is too high, and that is because it is set in the context of privatisation. There is a major problem with this. The network in Queensland is owned by the government, so “nationalisation” is already in place, and there is nothing to stop the state charging a lower rate than the cap set by the Australian Energy Regulator. Professor Quiggin claims the appropriate rate of return on the network should be the government bond rate. That is nonsensical. The government bond rate is the rate at which the government borrows. If the network return was that rate there would be no profit to the government and no cover for the risk they would be taking in providing the network. It would also discourage investment in the network as the government would be likely to get better returns elsewhere. On top of that it would be an effective subsidy to business customers, even if you consider the provision of “at cost” electricity to the householder as welfare. It would also push government borrowing higher, and making it more difficult to borrow for other assets which private markets can’t provide, and increasing borrowing costs at the same time as state debt became riskier. It also ignores the problem that the government has a conflict of interest. Not only are governments unlikely to take the same return on the network as it costs them to borrow, but as a monopoly provider they are likely to pad costs. One of the problems with the way we regulate networks is that it is done on a rate of return plus costs basis. The regulator not only allows the networks to recover capital costs, but it also allows them to recover all their administrative and maintenance costs as well. So there is no incentive to run lean and mean with staff. At around 2:15:00 Professor Quiggin says he’d accept privatisation if the private companies would accept the government bond rate as their rate of return. So, while he accepts the principal of privatisation, in practice his model would have no investors. But it is an interesting concession. 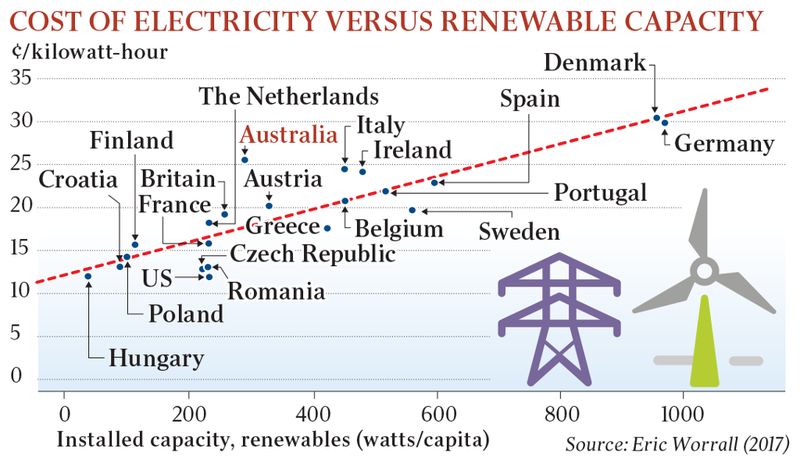 It is hard to square Professor Quiggin’s position on rates of return with his support for the renewables industry. He cheers on the demise of coal-fired power stations, owned by the state, but these are being replaced by windmills and solar panels owned by the private sector, and also by batteries and other storage devices, also owned by the private sector. 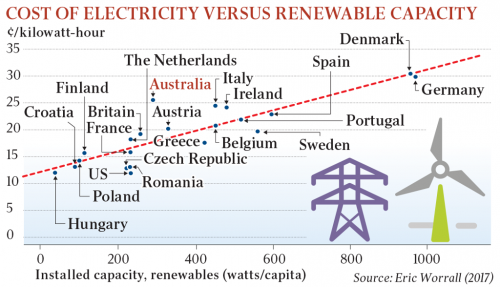 For the state government, as far as power generation is concerned, privatisation of generation is the preferred means to decarbonise, about which Professor Quiggin appears to have nothing to say. Final note: Do more intermittent renewables really mean more expensive power? As explained earlier, the costs of intermittents are hidden and relate to backup and reliability and it is easy to invent reasons for power increases, such as “It’s a problem with how we regulate the network”. What the graph below does is to strip out the irrelevant by demonstrating that in the real world there is a direct relationship. It’s impossible to argue with this, although it should be noted that Australia performs worse than most, so there are compounding factors here as well.